We put the top ten ice cream makers through rounds of rigorous testing to help you determine which one is right for you. Even though I’m no stranger to the joys of picking up a midnight pint, few culinary techniques feel as magical as transforming raw ingredients into ice cream and sorbet. A good ice cream machine is all you need to experience ice cream alchemy at home, and it will allow you to churn up your favorite flavors and swirl in your choice of mix-ins. The value-to-cost ratio on this lightweight model can’t be beaten. It utilizes a pre-frozen, coolant-lined canister to chill down the ice cream base, eliminating the need for salt and ice or an expensive compressor. When properly frozen, the canister churns up in the shortest length of time of all the models we tested, for creamy and smooth ice creams and other frozen desserts. This unassuming model has one button, a lid that easily snaps into place, and a small footprint for tight spaces. This compressor model by Cuisinart has the minimalist design and simple operation of the canister model, but it also has self-freezing capabilities. 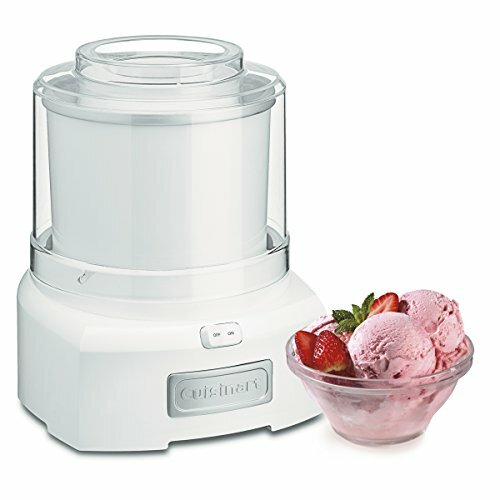 This allows you to make ice cream without any pre-planning, churning batch after batch without a loss in quality. This unit is also one of the smaller compressor models we tested, making it relatively easy to store in small kitchens. Just like the Cuisinart ICE-100, this model also features a compressor that chills the ice cream base down, so all you have to do is pour in your base and press a button. What sets the Breville apart is that it comes fully loaded with 12 hardness settings, precool and keep-cool options, as well as classic ice cream truck tunes that alert you when your ice cream is done churning. If you want to relive the good ole’ days of ice cream churning, this salt-and-ice-chilled unit may as well be a time machine. With the modern twist of a motorized churn, you can experience all the fun of traditional ice cream making without breaking a sweat. This inexpensive model holds up to a gallon of ice cream base in its canister, which is then surrounded by layers of salt and ice that freeze the ice cream base. There’s more to making ice cream than just freezing sweetened milk and cream. Ice cream’s smooth and melting texture is the result of countless tiny air bubbles worked into the base, and a mix of fat and ice crystals too small to detect on the tongue. The smaller these ice crystals, the smoother the texture of the ice cream, while air keeps the mixture from freezing hard as a rock. The amount of air churned into an ice cream base is called "overrun." Overrun is the percentage increase in the volume of the base after churning and it determines the final texture of an ice cream or frozen dessert. There are other factors besides the machine itself that affect texture, such as fat and sugar content as well as the viscosity of the base. Even so, a perfectly made ice cream base won’t go far in a bad machine. A properly churned ice cream base should look thick and dense, requiring you to scrape it out of the bowl, without any signs of greasiness or visible ice crystals. If the base is pourable, it was either improperly made to begin with, or hasn’t been frozen in the machine for long enough. All ice cream makers produce ice cream in the same way: First, the ice cream base is poured into a canister fitted with a paddle. Then the cold canister chills the base from the outside, freezing it, while the paddle turns, scraping the frozen bits up and stirring them evenly throughout the remaining ice cream base. This distributes and keeps the ice crystals small while incorporating air into the mix. Salt and Ice Chilled: Adding salt to ice lowers its freezing point, which creates a solution that hovers around 8°F to 12°F (-13°C to -11°C), which is cold enough to freeze ice cream. Today’s models mirror the design of old hand-crank salt-and-ice ice cream makers, but instead come fitted with a motor that turns the paddle. Canister Style: This style of ice cream maker comes with a removable coolant-line canister that needs to be frozen solid at 0°F (-18°C) before use. Once frozen, the canister is cold enough to freeze the ice cream base. Compressor Style: These units are self-chilling, getting down to a below-freezing temperature without ice or pre-freezing any parts. They can get as cold as -22°F (-30°C), however, it can take a while for compressor models to reach such chilly temps, while a fully frozen coolant-line canister will start out cold, resulting in a faster churn time. The two main features we look for in a great ice cream maker are, first, that it gets cold and stays cold, and. second, that it’s fitted with a paddle that evenly scrapes and blends the base. Proper ice crystal formation in the base is a secondary method of building structure and is key to ensuring sufficient overrun. If an ice cream maker doesn’t get cold enough, then the ice cream base won’t have sufficient air incorporated into it, resulting in a mixture that freezes hard and icy. Under-chilling the ice cream also results in ice cream that may look thickened and creamy after churning, but later freezes with large, grainy ice crystals. This is because ice cream that is under-churned and insufficiently frozen has too much free water in it, which then freezes into large ice crystals once transferred to the freezer. Under-aeration will also result in sweeter and richer ice cream since it concentrates the sugar and fat into a lower yield. A well-designed paddle is a key to smoothly textured ice crystals, small globules of fat, and incorporating a sufficient amount of air. We’re looking for paddles that successfully scrape off the frozen base and evenly incorporate it along with air into the still-unfrozen base. If the paddle doesn’t encourage sufficiently fluid movement of the base in the canister, then the resulting ice cream may have an inconsistent texture. Besides testing the texture, flavor, and overrun of ice creams churned in each of the machines, we evaluated other features, as well. We want ice cream makers that are easy to use, with parts that are clearly marked, quickly assembled, and feature a user-friendly interface. Effortless cleanup is a must, so we chose to only test models with removable bowls and paddles. Although we’ve been referring to them as ice cream makers, these machines can make a variety of frozen desserts, from ice cream and frozen yogurt to sorbet and sherbet. We decided to test a variety of bases in each of the machines to find the units which can consistently tackle them all. Even though the machines’ churning mechanism doesn’t change, these frozen desserts all have textures distinct from ice cream due to the different components in each base. American-Style Ice Cream: This style of ice cream is rich and high in fat, with plenty of overrun. American-style ice cream can be made with just milk and cream, as with Philly-style ice cream, or it can also have whole eggs or yolks, like New England-style frozen custard. Its unique ratios, distinct from creme anglaise, give these ice creams a high percentage of overrun, making the ice cream lighter. This style is also held at a cooler temperature than gelato, so it’s firmer, for nicely formed scoops. Gelato: This is an Italian style of ice cream that is made with just milk and some cream, for a relatively lower fat product. It also has less overrun, which makes it feel dense and rich. Gelato is served at a higher temperature than ice cream, between 8°F and 10°F (-13°C and -12°C), to emphasize its creamy texture. Sorbet: Sorbet contains no dairy, owing its texture to sugar and often the pectin and starches from fruit purées. Sorbets are often made from fruit purées and juices, but they can be in any flavor as long as there is no dairy of any kind. Sherbet: Sherbets are similar to sorbets, but they often have milk or cream in them, for a creamier texture without the dairy forwardness of ice cream and gelato. Frozen Yogurt: Frozen yogurts are made primarily of yogurt, but can often also contain milk or cream. They are much lower in fat than ice cream and therefore have a slightly icy texture. While spinning each frozen dessert, aside from taste-testing each, we also took notes on how easy each machine is to set up, operate, and clean. We gave preference to units with intuitive interfaces and useful extra features. We decided to start the testing by making a classic American-style vanilla ice cream. We opted for the double vanilla ice cream recipe from Stella’s cookbook, Bravetart: Iconic American Desserts. This ice cream base contains egg yolks, is high in fat and sugar, and is meant to have a high percentage of overrun so it’s light and easy to scoop from the freezer. We churned two 1-quart batches in each machine and measured the amount of overrun, the time it took to churn each batch, and evaluated the texture of each. The ice cream was tasted both immediately after churning while at the soft-serve stage, as well as after ripening overnight in the freezer. The ice cream machines took anywhere from 20 minutes to over an hour to freeze one-quart of ice cream base. We were expecting that the models that took longer to churn ice cream would also have poorly textured ice cream with large ice crystals. This was true of the models that took over 50 minutes to churn, but we found that all the ice creams that spun in under 50 minutes were the same, regardless of whether it took 20 minutes or 45 to churn. Outside of the units with longer churn times, one unit struggled to churn an evenly textured ice cream due to the shape of the paddle, which failed to combine and distribute the base evenly. Many of the machines produced a properly textured American-style ice cream, but this rich base is more forgiving due to the inherent creaminess of its low-water/high-fat formula. We decided to also churn a low-fat and low-sugar ice milk consisting of just strawberry purée and milk; a simple full fat frozen yogurt made with just sugar and yogurt; and a fresh pineapple sorbet to see if there were obvious differences among the machines. Without cream and eggs, we expected that it would be harder to achieve a smooth texture. All of the frozen desserts churned in roughly the same amount of time as it took to spin the equivalent amount of American-style ice cream. There were significant differences in the frozen texture of these bases, however. In general, all the frozen bases tasted creamier just after churning than they did after ripening in the freezer overnight. Without as much fat, they have a lower percentage of overrun, resulting in something denser, harder, and icier than ice cream. Because of those differences, the effects of paddle design and aeration are more apparent in frozen yogurt, sorbet, and milk ice. Differently shaped paddles create different churning motions. We found that asymmetrical paddles were better at churning the bases in an even swirling motion, incorporating more air, which resulted in slightly higher overrun and softer texture. With our second American-style ice cream test, we added chopped peanuts and caramel to the ice cream just before stopping the churning. The toppings were frozen ahead of time to prevent their addition from causing the ice cream to melt, which can lead to pockets of iciness and density. Although our recipes sometimes recommend adding ribbons to ice cream after the ice cream is fully spun, we wanted to test drizzling the toppings in while churning to see how evenly they would be distributed. Here, paddle design once again determined which machine did a better job of incorporating the mix-ins. Paddles with an asymmetrical design more evenly distributed the mix-ins, while the other paddles took so long to incorporate the peanuts that the caramel overmixed into the ice cream, losing its distinct ribbons. We obviously wanted to pick winners that made the smoothest and creamiest ice cream, sorbet, and frozen yogurt. Since many models performed equally well in those regards, we narrowed the list down by taking into account factors such as ease of use and cleanup, price point, and additional features. We found that these four winners were the easiest to operate, with wide openings for pouring in the base and toppings, clear buttons and interfaces, and an easy-to-clean design. We also took into account each model’s weight and footprint. Although we have one top pick, the best unit for you depends on many factors, such as how avid of an ice cream maker you are, and how much space and money you can commit in exchange for added convenience. The real value of a compressor unit lies in churning back-to-back quarts of ice cream in a single day, a feature that only the most dedicated ice cream enthusiast will ever need at home. For those who only churn a few quarts every week, canister units are more than up to the task. What we liked: This affordable unit by Cuisinart has been the go-to ice cream maker at the Serious Eats test kitchen for some time and it really earned its place as our favorite throughout all the testing. The small, lightweight model freezes the ice cream base through the assistance of a coolant-lined canister. The canister must be frozen solid before setting it onto the motor’s housing, which spins the canister while a stationary paddle scrapes the sides of the bowl and churns the ice cream. This model has the fastest churn time at an average of 20 minutes, resulting in a smooth-textured ice cream every time. The Cuisinart also has the highest overrun of all the models we tested, at about 30 percent for American-style ice cream bases. The asymmetrical style of the paddle promotes even folding and mixing of the ice cream base, leaving minimal unscraped base frozen along the canister walls. It features a simple one-touch operation with a wide opening for a full view to watch all the churning action and to easily add mix-ins of any size. The canister has a one-and-a-half-quart capacity; however, for ice creams with a lot of overrun, we don’t recommend churning more than a quart of base at a time. What we didn’t like: The quality of ice cream this model produces hinges on the thorough freezing of the canister. The canister should be frozen until fully solid; the manufacturer recommends a minimum of 16 to 24 hours in a freezer set to 0°F (-18°C). It’s also important to keep in mind that all freezers go through thaw cycles, so if you attempt to churn ice cream immediately after a thaw cycle, it’s possible the canister is not chilled enough, regardless of how long it’s been in the freezer. This model is best suited for individuals with a good freezer, space in it to dedicate to chilling the canister, and those who churn no more than five quarts of ice cream per week. 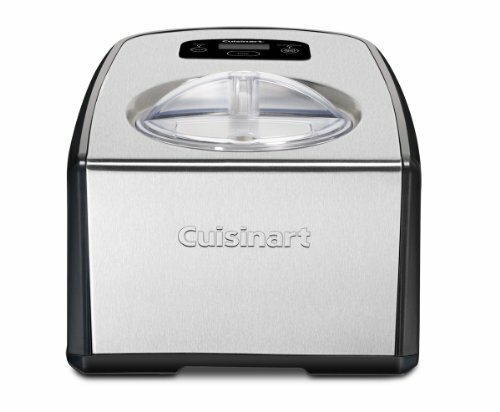 What we liked: This model from Cuisinart has a compressor that chills the ice cream base without the need to pre-freeze an insert or use a mixture of salt and ice. That means you can churn back-to-back batches of ice cream at a moment’s notice; there’s no need to plan ahead and chill a canister or worry about freezer space. A batch of ice cream takes 40 minutes on average to churn, and there is also a "Cool" function which will hold the ice cream for up to ten minutes. Just like our top canister Cuisinart pick, this model also features a minimalist design and simple operation. The interface includes three buttons; one to turn the unit off and on, one to set the churning time, and another to start churning. By default, the timer sets to 60 minutes, but it is easily adjustable to your desired churn time and churning can be stopped at any time. The locking lid has clearly marked arrows making it quick to attach and remove. The bowl where the churning action happens has a wire handle, which allows you to lift it out for easily transferring the ice cream and makes cleanup a cinch. Once the bowl is emptied and washed out, you can immediately churn the next batch without delay—just be sure to thoroughly dry the sides or the water can freeze the bowl to the unit. After removing the paddle, there is no dowel running through the center of the bowl (something present in many of the other models) giving your spatula clear access to scrape out the finished ice cream. The paddle design is similar to the canister Cuisinart ICE-21 model and therefore yields ice cream with a comparable amount of overrun and a similar final texture. While most ice cream machines warn you not to fill the canister more than 60%, this model tells you not to fill above the top bar on the paddle—a clearly demarcated max fill line that reduces user error. What we didn’t like: The model comes equipped with two paddles, one for gelato bases and another that is supposed to incorporate more air into ice cream bases. After making batches of high- and low-fat ice cream with both paddles, we found that they created ice creams with equal textures and overrun. In our testing, we found no difference between the results of the paddles. Also, both paddles have high, squared shoulders where ice cream would get stuck, which required stopping the machine intermittently and scraping the ice cream back into the bowl for even churning. What we liked: Just like the Cuisinart ICE-100, the Breville Smart Scoop has a compressor for self-freezing capabilities, but what sets this unit apart is its fully automated churning. The model has 12 hardness settings, ranging from softer spun sorbets to hard scooped ice cream. Although we admit 12 settings is more than necessary, we did find the settings to be accurate. This model automatically stops churning once the ice cream has reached your selected texture by sensing the level of resistance against the paddle as the ice cream freezes and thickens. Once the ice cream is ready, the unit alerts you with (optional) classic ice cream truck jingles. The churned ice cream can be held at the chosen texture for up to three hours, perfect for dinner parties and for soft serve ice cream fans. If you prefer to take control over your ice cream churning, the Breville also has a manual option. Most bases take an average of 40 minutes to complete churning, but if you choose the ten-minute "Precool" option to chill down the machine before adding the base, that churning time can be cut in half (saving you about ten minutes in total). This unit also has a maximum capacity of one and a half quarts, but, once again, for high overrun bases, it’s best to churn no more than a quart at a time. What we didn’t like: The shape of the paddle results in the ice cream spinning along the center dowel, unlike the folding and sweeping motion produced by the Cuisinart’s paddle. This motion resulted in unevenly distributed mix-ins and left a layer of unspun hardened ice cream base along the inside of the bowl. This model is also big, heavy, and expensive, requiring an investment of both money and counter space. 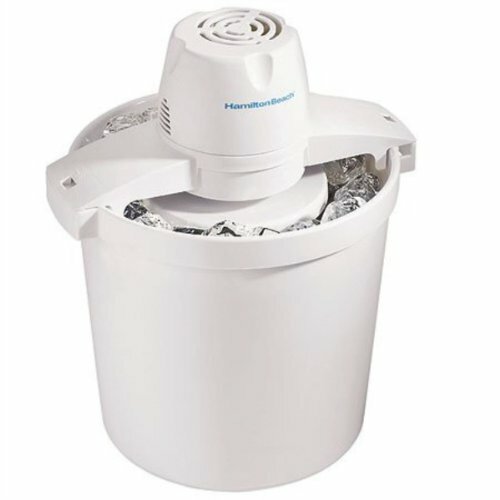 What we liked: This unit by Hamilton Beach lets you experience the old-school fun of a hand-cranked ice cream maker without requiring any elbow grease. The ice cream base is frozen by surrounding it with a solution of ice and salt, while it is churned by a motor that locks into place on the top of the unit. What we didn’t like: This unit had the longest churn time, averaging about one hour, and also gave us slightly icy results. Because this model depends on salt and ice to freeze the ice cream, it can be a messy process best suited to backyards and patios. The Klarstein ice cream machine has a detachable motor located on the top of the unit, rather than housed within it like the others, that rotates the paddle. It can be tricky setting the motor on top and locking it into the paddle. We had to rotate the paddle with tweezers in order to line up the keyhole to lock the motor into place. Because the motor is on top of the unit, it’s difficult to peer inside the canister in order to monitor the status of the ice cream churning. The opening for adding mix-ins is very small and located behind the motor, which makes it easy to spill sticky caramel and other mix-ins onto the motor. We worry that the combination of a detachable motor, which also has an opening for mix-ins so close to it, can make this unit susceptible to breakage. Both the Hamilton Beach and the Nostalgia ICMP400 operate identically, with the same paddle, capacity, and churn time. We gave a slight edge to the Hamilton Beach because the plastic paddle has a metal dowel running through it, while the Nostalgia has all-plastic construction. The churning paddle on the Kitchen Aid stand mixer ice cream maker attachment is square, reaching the very top of the bowl while not fully scraping the bottom. This design led to spillage when adding the base as well as the mix-ins; additions would bounce or pour off the paddle itself. Also, once the base thickened, the paddle appeared to be pushing the ice cream around the bowl, with little scraping or folding motion, rather than the more cyclical, churning motion of other paddles. This resulted in portions of ice cream that appeared both over-churned and greasy as well as those that appeared under-churned and icy at the same time. We didn’t have as obvious of a consistency issue churning lower-fat bases, such as frozen yogurt and sorbet. The Ariete Ice Cream Maker by DeLonghi has a similar bowl, paddle, and lid design as the Cuisinart, our top compressor pick, and therefore performed very similarly. We ultimately went with the Cuisinart over this model because we prefer the simplicity of the control panel, smaller footprint, and lower price point of the Cuisinart. The Della Ice Cream machine is equipped with a yogurt maker function, which warms the milk and culture up to set it, before chilling it down to serving temperature. If you’re interested in an ice cream and yogurt machine combo then this is your best bet. However, next to the competitors, this unit took the longest to fully churn the ice creams and sorbets, upwards of 70 minutes. The touch screen panel is also not very sensitive; we had to press down hard to activate the buttons. The Whynter ice cream machine was the top pick for Wirecutter and performed well in our tests, producing smooth ice cream with texture comparable to that of our top picks. We ultimately chose the Cuisinart ICE-100 as out top compressor model for it’s smaller footprint and lower price. We considered testing the Lello Musso Lussino Ice Cream Maker, Cuisinart Electronic Ice Cream Maker, and the Mr. Freeze Thermoelectric Ice but removed them from consideration because they do not have removable bowls, a feature we can’t live without. At home, Stella has a Girmi Automatic Ice Cream Machine, a discontinued model we were unable to include. She cross-tests all recipes on a Cuisinart ICE-21 and reports comparable results. We decided not to test one of Cook’s Illustrated’s top picks, the Cuisinart Cool Creations Ice Cream Maker because it was an older model than the Cuisinart compressor unit we tested.